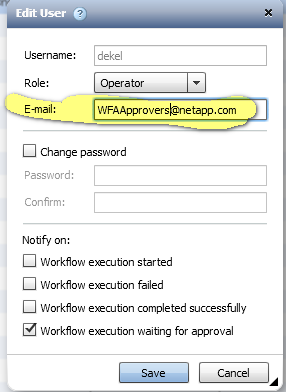 I am encountering an issue with WFA in sending email notifications for workflows that are pending approval. My logic is that anyone who has a user account as an "Admin" role, with notifications enabled, should be receiving emails for any jobs that are pending approval. However this is not the case. Notifications are only being sent to the user that initiated the request, with notifications turned on for their account. This is pointless, as the user already knows it is waiting for approval. We want the admin users to know, so that they can approve these workflows. Any help anyone could provide would be great. In case you would like to send the notifications to other list users (can be all admins or any subset ) you can use place a DL (distribution list ) in the mail field of the operators. My way around this was to use the Netapp certified "Send Email" command and just have that send an email to a distribution list just before it hits the approval point. If you don't have a DL handy you can probably just use a comma separated list of email addresses. Not sure if the Send Email command accepts multiple email addresses to send to but it wouldn't be too hard to add that functionality in, provided you know a bit of powershell. Thank you both for your quick response and recommendations. For now the distribution list in the operator field will serve my purposes. The daily email would be a nice feature to see as well.